Open Educational Resources can now claim a history that goes back at least fifteen years. What it cannot claim at this stage is that its influence is certain for the future. One way of considering the future of the OER movement is to imagine what research will be conducted five or ten years from now. To support this thought experiment, we can start by examining the research that has been conducted over the past ten to fifteen years. 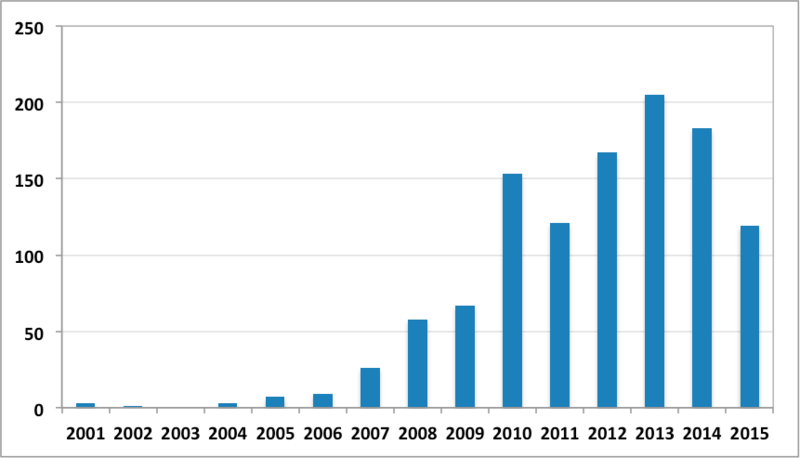 Using the OER Knowledge Cloud as the basis for this analysis, Figure 1 demonstrates how the number of OER publications has grown since the inception of the concept in 2001. Figure 1 – Number of OER publications per year, as represented in the OER Knowledge Cloud. Based on this analysis, we can say that OER research outputs have increased, establishing the field. Numbers have plateaued, though, at least as recorded in Knowledge Cloud. Using a content analysis approach, we can also compare the themes from one year to the next. This has been done in Table 1 for 2007 (the first year in which more than ten publications were produced) and 2015 (the most recent year for which we have complete data). The same four themes from 2007 persisted to 2015, but were supplemented by six additional themes. This pattern suggests that change in the field is not one of radical revolution, but a growing sphere of interest, as OER become more applicable to different problems. However, those new application areas can dominate the field, as shown by the prevalence of MOOC papers. MOOCs – These will probably constitute a separate domain and become less connected to OER themes. OER as subject – The tension around whether open practice’s goal should be to transform education or to supplement existing practice is likely to become more of a focus for debate. Research with impact data – So far a persistent minority theme; we can expect increases in both the requirement for this type of research and the capability to produce it. OER and data analytics – OER in combination with learning analytics, and the crossover with data viewed as an OER in itself. Open pedagogy – As OER becomes more of an accepted part of practice, openness encourages more experimentation with pedagogy, as well as a move from doing the same things more cheaply to exploiting the options of openness. Open ledgers of achievement – There is now a demonstrated ability to support an online currency (bitcoins) through a distributed ledger system (blockchains). This is starting to trigger researchers to consider how this might change the granting of recognition for OER and open learning. OER and society – OER research has already clearly moved beyond its starting point as a set of project case studies. The next phase may be to complete the move from an interest in OER itself to observing how OER influence different fields. OER, and the openness that follows, are key to rethinking how society and its citizens operate in the 21st century. Research that engages with this more sociological perspective may well be the route to a leap from the evolution we currently see to the revolution that remains needed to truly enable education for all. In conclusion, OER research has evolved over the past fifteen years as its areas of interest and application have expanded. This pattern is likely to intensify in the immediate future, now that OER has established a basis for operation. While some future directions can be discerned from current practice, there will undoubtedly be unexpected research areas that come to prominence, sparked by the opportunities of openness. This work by Martin Weller and Patrick McAndrew is licensed under a Creative Commons Attribution 4.0 International License.